Photographer Olivia Hemaratanatorn captured this view of space shuttle Endeavour soaring over Griffith Observatory during its flyover of Los Angeles on Sept. 21, 2012. Endeavour landed at Los Angeles International Airport, and will go on display at the California Science Center. Californians young and old came out to greet the retired space shuttle Endeavour as it landed in Los Angeles last week atop a jumbo jet. Endeavour, a veteran of 25 flights to space, is due to take up residence soon as an exhibit at the California Science Center in its new Los Angeles home. Endeavour hopscotched across the country from Florida to Texas, eventually arriving at the Los Angeles International Airport (LAX) Friday (Sept. 21), riding piggyback aboard NASA's modified Boeing 747 Shuttle Carrier Aircraft. An unidentified man and child were at Griffith Observatory, Los Angeles, for the flyover of shuttle Endeavour on Sept. 21, 2012. "It's the end of manned spaceflight, maybe for the rest of my lifetime. It's a historic event. I had to be here. When my dad was 14, he watched Lindbergh take off. This is the full circle. "I wanted to see Endeavour. I've been following it since July on Twitter and everything trying to get to it. "We wanted to see the shuttle fly over, just to see it and not [only] on newsreels or books or hear about it in elementary school classes. "It was amazing. It was a strange sense of pride to think of where it's been, that it's flown out of our atmosphere and for it to be this close. For those Californians who didn't get a chance to see Endeavour fly in, it's not too late. Next month, starting Oct. 12, the orbiter will make its final trek from the airport to its museum home. 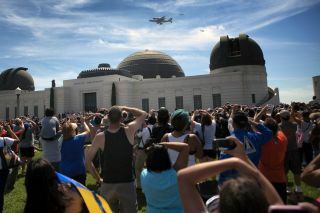 During the 12-mile (19-kilometer) trip, the shuttle will be paraded through the streets of Inglewood and Los Angeles, giving thousands of people an up-close view of Endeavour on the move one last time.